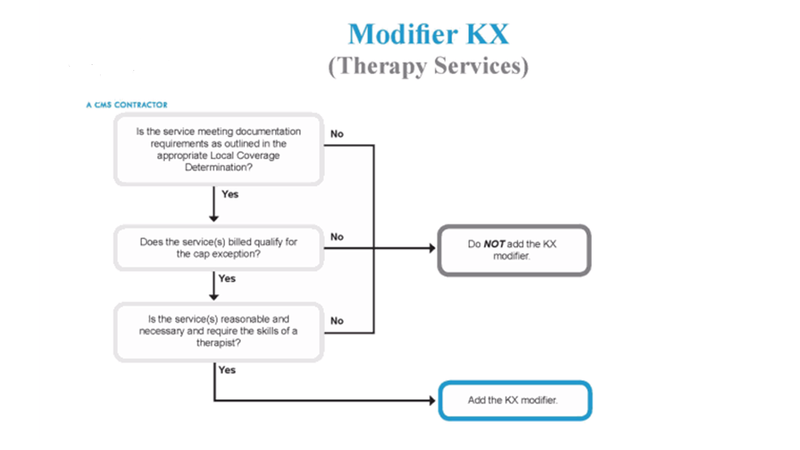 Modifier KX for use with Therapy Services | Medical billing cpt modifiers and list of medicare modifiers. Modifier KX is used to confirm requirements outlined in the appropriate Local Coverage Determination (LCD), are met for the procedure billed. By adding modifier KX to a claim, you are stating that your claim has met specific documentation requirements in the policy, and would be available upon request from the Medicare Administrative Contractor (MAC). Add this modifier to each procedure code once the specific therapy cap has been met. 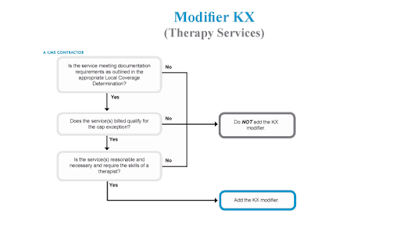 Modifier KX should follow the appropriate therapy modifiers. The KX may be submitted on physical therapy, occupational therapy or speech language pathology claims. When additional documentation supports the medical requirements of the service under a valid medical policy. When the claim provides all information on the service billed and medical documentation does not provide further explanation. Claim does not meet policy guidelines/ Indications and Limitations of Coverage and/or Medical Necessity. The most frequent use of the KX modifier is in relation to therapy services. When the service qualifies for an automatic claims processing exception * based on the published list of excepted conditions and complexities, submit the service with Healthcare Common Procedure Coding System (HCPCS) modifier KX. The KX must be added to each claim line identified as a therapy service when therapy cap exceptions meet all guidelines for an automatic exception and must follow the required therapy HCPCS modifiers GN (speech-language pathology), GO (occupational therapy) and GP (physical therapy). This allows payment for the approved therapy services, even though they are above the therapy cap financial limits. Therapy services submitted without the KX modifier, for claims above the therapy threshold, will deny. Exceptions to therapy caps based on the medical necessity of the service are in effect only when included in Congressional legislation.